Vaccine-preventable diseases include but are not limited to measles, polio, whooping cough, tetanus, diphtheria, meningitis, yellow fever, hepatitis B, tuberculosis, pneumonia, diarrhoea and cervical cancers. Among these diseases, measles remains one of the leading causes of death among young children globally, despite the availability of a safe and effective vaccine. Measles is estimated to have caused 145 700 deaths globally in 2013, of which it is estimated that 38 000 were in the countries within Africa. It is a highly contagious, serious disease caused by a virus. In 1980, before widespread vaccination, measles caused an estimated 2.6 million deaths each year. In 2013, the coverage estimates indicate that 74% of children in Africa have received one dose of measles vaccine by their first birthday, up from 53% in 2000. Since 2001, more than 750 million children have been vaccinated in Africa against measles through supplemental mass vaccination campaigns. Measles-related deaths are caused by complications associated with the disease. Complications include severe diarrhoea and related dehydration, severe respiratory infections such as pneumonia, blindness, encephalitis (an infection that causes brain swelling). Measles can also trigger severe malnutrition or disseminated tuberculosis infections. Severe measles is more likely among poorly nourished young children, especially those with insufficient vitamin A, or whose immune systems have been weakened by HIV/AIDS or other diseases. In populations with high levels of malnutrition and a lack of adequate health care, up to 10% of measles cases result in death. Measles outbreaks can be particularly deadly in countries experiencing or recovering from natural disasters, conflicts or weaknesses in health systems. In countries where measles has been largely eliminated, cases imported from other countries remain an important source of infection. The highly contagious virus is spread by coughing and sneezing, close personal contact or direct contact with infected nasal or throat secretions. The first sign of measles is usually a high fever, which begins about 10 to 12 days after exposure to the virus, and lasts 4 to 7 days. A runny nose, a cough, red and watery eyes, and small white spots inside the cheeks can develop in the initial stage. After several days, a rash erupts, usually on the face and upper neck. Over about 3 days, the rash spreads, eventually reaching the hands and feet. Severe complications from measles can be avoided through supportive care that ensures good nutrition, adequate fluid intake, vitamin A supplementation and treatment of diarrhoea with recommended oral rehydration solution and zinc. This solution replaces fluids and other essential elements that are lost through diarrhoea or vomiting. Antibiotics should be prescribed to treat eye and ear infections, and pneumonia. AHO recommends reaching all children with two doses of measles vaccine as the standard for all national immunization programmes. 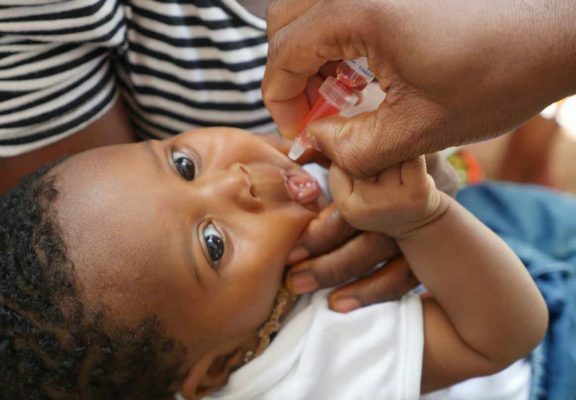 In countries with ongoing measles transmission, the first dose of measles vaccine is recommended to be administered at 9 months of age and the second between 15 – 18 months of age.